What should I know when buying a two-way radio? There are a lot of rules and regulations governing short- and long-range radio communication and as an authorized Motorola two-way radio dealer in New York, it is our duty to keep our customers educated on these rules. One thing you should know is whether or not you’re buying from an authorized manufacturer’s dealer. If you’re buying from an unauthorized dealer, you should know that most manufacturers do not warranty products sold by these types of dealers. Radios purchased at Altech that are covered under warranty, are sent back at no additional charge. Not all Motorola two-way radio dealers are created equal; you want to make sure you’re buying from a trusted Motorola authorized two-way radio dealer. What are grey market radios? How do I know if I bought one? Grey market radios are manufactured out of the United States and are sold in the US illegally. Federal Communications Commission (FCC) approved devices will have an FCC label on them. People who are caught using non-approved or counterfeit electronics devices may be subject to a large fine and in some cases, imprisonment. Read the official FCC statement here. Expert tip: Check the device’s condition. Make sure what you’re buying is actually new and not just refurbished. Many online retailers will change an electronic device’s housing and then try to sell them as “New Old Stock”, “B stock” or “New Out of the Box”. If you encounter these descriptions on an online seller’s site, be wary. 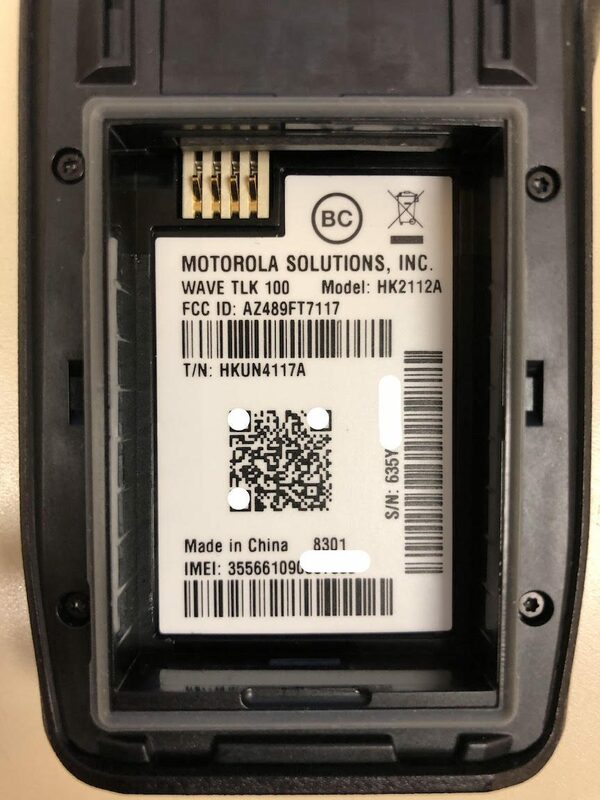 FCC approved devices should have an FCC ID. A proper FCC label is displayed below. What should I know about two-way radio range? Make sure the two-way radio you choose is right for the area you want to cover. While walkie talkie range varies from one device from another, high levels of interference will significantly decrease the quality of your communications. Generally, walk-throughs are recommended for NY two way radios, and two way radios in other large cities and bustling suburban areas when purchasing long-range walkie talkies or long-range two-way radios because these areas are subject to significant interference. What should I know about my Motorola warranty? When buying a two-way radio, make sure that the radio dealer you’re purchasing from gives you the correct warranty and exposes you to the right education on two-way radios. Keep in mind that most two-way radios come with warranties that cover them for more than one year from the date of original purchase. Make sure that the online seller is providing you with a Motorola warranty and not their own in-house warranty service which may differ from a legitimate factory warranty. Additionally, it’s important to know how the brand or retailer handles equipment warranties. For instance, is shipping and handling back to manufacturer covered or is it an out-of-pocket, non-reimbursed expense? Radios purchased at Altech that are covered under warranty or sent back at no additional charge. Is programming included in the purchase price? Do the radios I’m purchasing need to be reprogrammed or modified? How is that programming process handled? Are there additional fees such as shipping that I have to pay the seller I purchased the radios from? Generally, how long does programming take? Do I need an FCC license? Most two-way radios require individuals and non-individuals such as businesses to have a Federal Communications Commission (FCC) license. When you purchase a radio that operates in the commercial frequency ranges, the FCC requires a 10-year FCC radio operator license. Failure to comply can cost operators up to $19,639 per day of marketing violations and up to $147,290 for an ongoing violation. Why? Users can interfere with other types of communications equipment including public safety and large enterprise customers. Just because you can’t hear them it doesn’t mean you’re not interfering with them. Also, certain frequencies require in-person monitoring to ensure there is minimal interference. At Altech, we specialize in FCC licensure and can show you how to get an FCC license in NYC, so you can avoid having your incomplete application returned, long delays and the reapplication process. From FCC license requirements & costs in NYC to FCC license renewals, navigating the licensing database, and radio operators licensing, our wireless radio services experts are here to help. Before buying a new two-way radio, make sure that the battery and other accessories are the same brand as the radio you’re purchasing, For example, some Motorola radios that are sold online come with a cheaper, non-brand or counterfeit battery, rendering the radio warranty null and/or negatively impacting the performance and life of the radio. Need a replacement part foor a Motorola two-way radio? You should also consider the environment you’ll be using the equipment in; is it hazardous? Is it subject to extreme temperatures and/or hazardous substance? Do you need radios with long-range communication or special rugged housing? If so, be on the lookout for the UL symbol. You’re probably wondering, ‘What is UL approved?’ UL is an acronym for Underwriters Laboratories, a leading product safety testing and certification organization that tests products for safety risks. If so, you may want to evaluate two-way radios based on how well they meet the requirements of challenging environments.